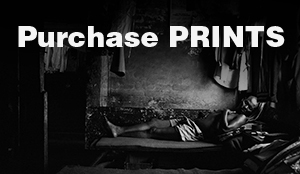 “I was terrified putting this thing up,” said photographer Omar Badsha one Saturday in early June. He was referring to the process of self-curating his astonishing career survey exhibition, Seedtime, on at the Iziko South African National Gallery in Cape Town. “I wasn’t sure it would work.” Wearing a blue ball cap and sober business shirt, Badsha was addressing an audience gathered to listen a group of panelists make sense of his work, which spans five decades and includes woodcuts, pencil and crayon drawings and photographs. Based on their qualified feedback, his fears were unfounded. “This is a landmark exhibition,” stated cultural activist and curator Mario Pissarra. Art historian Lize van Robbroeck agreed. “An exhibition like this cannot be resisted. It makes history come alive.” Arguably the most rousing endorsement of Badsha’s exhibition, which takes its title from the poem No More Lullabies by Mafika Gwala, came from an audience member. The young black man simply thanked Badsha for visually recording aspects of his family’s history. Badsha’s career as an artist and political activist begins in Durban. Born into a Gujarati Muslim family in 1945, he grew up at 7 Douglas Lane under an uMdoni tree planted by his grandfather, who immigrated to SA from India in the 1890s. It was a politicised household, his “radical family” forming part of a larger community of Communist Party members who decorated their homes with pictures of Jawaharlal Nehru and Mahatma Gandhi. “We don’t come from a vacuum,” Badsha said of the collective politics that informed his career as an activist. His decision to pursue an art career was not counterintuitive to his background. His father, Ebrahim Badsha, was a skilled portraitist, portraiture being a recurring feature of Badsha’s work as a draughtsman and photographer. Photography only came later, though. In 1965, he won an award for a small woodcut shown at an exhibition in Durban. His activism however prevented him from realising his dream of studying abroad after the apartheid government refused him a passport. Seedtime includes a number of Badsha’s early works on paper, many found decades later in his father’s care. Though working in an abstracted manner typical of postwar art, the human figure – distorted, faceted and oversized – is a constant reference point in his early work. Artist Dumile Feni, whom he met in Johannesburg around 1966, was also a formative influence. The two roomed together. “He was a powerful force in this country. He made the black body a powerful instrument.” Feni, who died in exile in 1991, kept some of Badsha’s early works with him in exile. They are included in Seedtime. But his greater contribution was conceptual. In a 2005 interview, Badsha told me how his discussions with Feni showed him how to portray “oppression and the loss of dignity without chains and bars”. This attribute, of recovering “dignity and humanity”, of “bearing witness to the ordinary and the everyday” is crucial to appreciating Badsha’s work as an artist. It is also what prompted influential critic Neville Dubow to single him out for praise in 1969. Dubow early on highlighted Badsha’s “highly personal vision”, adding that it was “sensuous and capable of carrying the burden of pathos”. Though he was speaking about Badsha’s works on paper, Dubow’s remarks hold true of his photography too. The artist’s move to photography, which forms the bulk of Seedtime, was prefaced by a significant pause. In 1973 Badsha moved to Pietermaritzburg to work full-time as a unionist. Three years later he started taking photographs of work-related injuries at chemical plants. A show of five parts, Seedtime includes four sections of photographs. Spanning the years 1976 to around 2010, the photographs were made in SA, Denmark, Ethiopia and India, where he has been photographing his grandparents’ ancestral village in Gujarat since 1996. The striking central section, which is also the largest by volume, is titled Narratives of a Time of Revolution and records aspects of SA’s struggle for democracy. Seedtime confirms Badsha as a major photographer. His distinction lies in his portrait work. “My subject matter is people,” he told his audience. Always marked by great affection, Badsha’s best portraits capture the dynamic interplay of history and personal circumstance. Standout works from his retrospective include a 1983 study of a portly induna from Amouti in KwaZuluNatal bursting out of his pants, a 1980 Durban street scene showing an old man in a suit peering around a corner at a performer, and an on-the-move shot of an incapacitated woman from Inanda being carried in a blanket to the pension office in 1980. All are marked by the photographer’s enquiring eye and big heart. 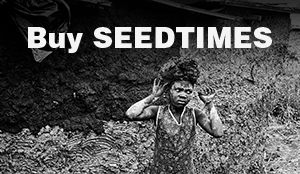 But Seedtime offers much more than just portraiture. Badsha’s photographs record the rituals of being human: the difficulties and struggles that characterise workingclass life, but also its pleasures. The preponderance of sjamboks and bullhorns, of placards and T-shirt slogans are not solely meant to function as historical evidence. Badsha, a self-described “cocky Indian” who hasn’t forsaken his activist roots, hopes his exhibition will speak to the present. A topsy-turvy present embracing the idea of what he described as a “continuous revolution”.